Ramsey Town FC are from the left, back, Neil Machett, Nathan Ginty, Antonio Monteiro, Sam Pell, Lea Jordan, Daniel Edwards, Lewis Stone, Jamie Darlow, front, Adam Rothery, Adam Taylor, Joshua Rust, Aiden Stanford, Daniel Hook, Jamie Baxter and Simon Flanz. 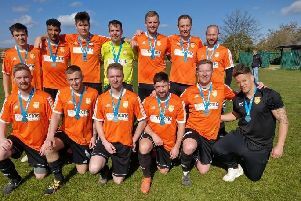 Ramsey Town boosted their title hopes in Division Two of the ChromaSport & Trophies Peterborough League last night (May 3). They went three points clear of Whittlesey Athletic ‘A’ at the top with a 4-0 win at Langtoft United Reserves. Jamie Darlow (2), Adam Rothery and Aiden Stanford got the goals and Ramsey now need to win one of their two remaining fixtures - away to Tydd St Mary (May 9) and ICA Sports Reserves (May 13) - to take the title. In the Premeir Division, third-placed Netherton United drew 2-2 with fourth-placed Moulton Harrox while Langtoft were 3-2 winners at Sawtry. In Division One there were goals galore for Peterborough Polonia. They were at home to Riverside and ran out 8-1 winners with Adrian Mizia netting five times. Division Four champions Premiair beat Cardea 3-0 through strikes by Isaac Twigden, Ryan Alban and an own goal.